Intercomp 4 Cell AA Battery PackIntercomp 4 cell AA NiMh Battery Pack. Battery Pack for Current Generation PT300™, LP600™ and CW250™ Series Scales from Intercomp. In 2010, Intercomp introduced a higher efficiency battery stick containing 4 cells as opposed to the older 6 cell design found in previous models. Please verify which version you require BEFORE ordering. Contact Intercomp Customer Service at 800-328-3336 if you are not sure which battery to order. 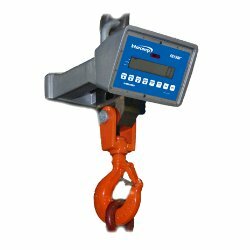 Intercomp CS-750 Digital Hanging Scale 1000 lb.Intercomp CS750 crane scale with 1000 lb. capacity is an economical digital hanging scale for people on a tight budget. Ideal for weighing engines, race car frames, fuel dump cans, etc. Dozens of uses in every shop! Intercomp's CS750 is the premier choice with it's large, easy-to-read, display, ultra-high resolution, 20-bit A/D converter provides the highest accuracy available, and an Infared Remote are standard for operating at a distance. Normal leadtime before this product ships out is 1 week. Intercomp CS1500 Crane Scale 1000 lb.Intercomp CS-1500 high performance NTEP certified digital crane scale -- All electronics are shock mounted in a weatherproof cast aluminum case. This assures maximum protection against moisture, dust, and rough usage. High visibility 0.8 inch/20 mm LED digital readout provides easy reading of weights; recessed push button switches allow simple, trouble-free operation. Capacity: 1000 pounds. Normal lead time for this product is 2 to 3 weeks. Intercomp CS1500 Crane Scale 20,000 lb.Intercomp CS-1500 high performance NTEP certified digital crane scale with 20,000 pound max capacity features electronics mounted in a weatherproof cast aluminum case. This assures maximum protection against moisture, dust, and rough usage. High visibility 0.8 inch/20 mm LED digital readout provides easy reading of weights; recessed push button switches allow simple, trouble-free operation. Normal lead time for this product is 2 to 3 weeks. Intercomp CS1500 Crane Scale 5000 lb.Intercomp CS-1500 high performance NTEP certified digital crane scale with 5000 pound max capacity features electronics mounted in a weatherproof cast aluminum case. This assures maximum protection against moisture, dust, and rough usage. High visibility 0.8 inch/20 mm LED digital readout provides easy reading of weights; recessed push button switches allow simple, trouble-free operation. Normal lead time for this product is 2 to 3 weeks. Intercomp CS200 Hanging Scale 100 lb.Nice economical 100 pound capacity digital hanging scale for people on a tight budget -- Includes Peak Hold feature. All electronics are shock mounted in an ABS plastic case. This allows for protection from rough usage. High visibility 1/2" LCD digital readout provides easy reading of weights; membrane push button switches allow simple trouble-free operation. Normal lead time for this product is 3 to 5 business days. 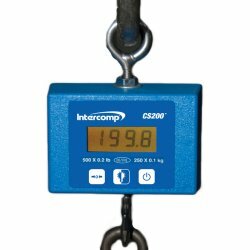 Intercomp CS200 Hanging Scale 25 lb.25 pound max capacity digital hanging scale for people on a tight budget -- Includes Peak Hold feature. All electronics are shock mounted in an ABS plastic case. This allows for protection from rough usage. High visibility 1/2" LCD digital readout provides easy reading of weights; membrane push button switches allow simple trouble-free operation. Normal lead time for this product is 3 to 5 business days. Intercomp CS200 Hanging Scale 250 lb.Nice economical 250 pound max capacity digital hanging scale for people on a tight budget -- Includes Peak Hold feature. All electronics are shock mounted in an ABS plastic case. This allows for protection from rough usage. High visibility 1/2" LCD digital readout provides easy reading of weights; membrane push button switches allow simple trouble-free operation. Normal lead time for this product is 3 to 5 business days. 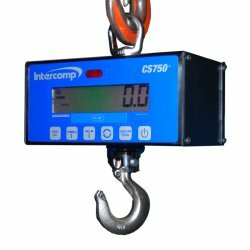 Intercomp CS750 Digital Hanging Scale 100 lbIntercomp CS-750 digital hanging scale for people on a tight budget. Intercomp CS750 with 100 lb capacity is the premier choice with it's large, easy-to-read, display, ultra-high resolution, 20-bit A/D converter provides the highest accuracy available, and an Infared Remote are standard for operating at a distance. Normal leadtime before this product ships out is 1 week. Intercomp CS750 Digital Hanging Scale 300 lbIntercomp CS-750 digital hanging scale item# 100653 is the premier choice with it's large, easy-to-read, display, ultra-high resolution, 20-bit A/D converter provides the highest accuracy available, and an Infared Remote are standard for operating at a distance. Capacity is 300 lb. Normal leadtime before this product ships out is 1 week. Intercomp CS750 Digital Hanging Scale 500 lbIntercomp CS-750 digital hanging scale item# 100654 is the premier choice with it's large, easy-to-read, display, ultra-high resolution, 20-bit A/D converter provides the highest accuracy available, and an Infared Remote are standard for operating at a distance. Capacity is 500 lb. Normal leadtime before this product ships out is 1 week. Intercomp CW250 15x15 Floor Scale 150 lb.150 lb. capacity portable Intercomp CW250 with 15"x15" platform is ideal for weighing tanks, drums, boxes, cylinders, and miscellaneous items. Scale is battery operated (charger adapter and cable provided) 150 lb cap is non ntep. Normal lead time for this item is 2 weeks before shipment. 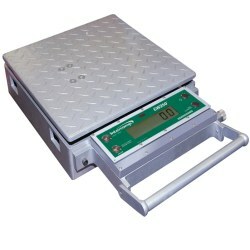 Intercomp CW250 15x15 Platform Scale 300 lb.Intercomp CW250 300 lb. scale with 15"x15" platform is ideal for weighing tanks, drums, boxes, cylinders, and miscellaneous items. Scale is battery operated (charger adapter and cable provided) This rugged self-contained unit is NTEP Class III approved 95-024. Normal lead time for this item is 2 weeks before shipment. Intercomp CW250 15x15 RampRamp for Intercomp CW250 15"x15" portable scale.